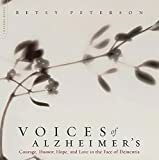 Review of "Voices Of Alzheimer's"
Voices of Alzheimer's is a collection of quotations from people who have Alzheimer's, or have received a diagnosis of a similar disease, or people who care for them. Most of these are from previously published accounts in books, newspapers, magazines, TV and radio shows, or the Internet. They are collected in many chapters with different overlapping themes. They express many different emotions that arise when dealing with progressively worsening dementia, and of course most of them show sadness, frustration, confusion, anger, and grief. Some quotations reflect on what the speaker learned or how their experience was different from that of others. Patients often have surprising things to say, and sometimes they are funny or at least bittersweet. This is not a book that is going to provide comprehensive information about Alzheimer's, but it is an easy read that you can pick and put down at any time, browsing through it again and again, finding something striking every time. As such, it may be helpful to people in the early stages of Alzheimer's or family members caring for Alzheimer patients who don't have time to sit down and read a book from beginning to end. It gives a personal outlook on the difficulties by people coping with long days and hard choices, and it is often very moving.